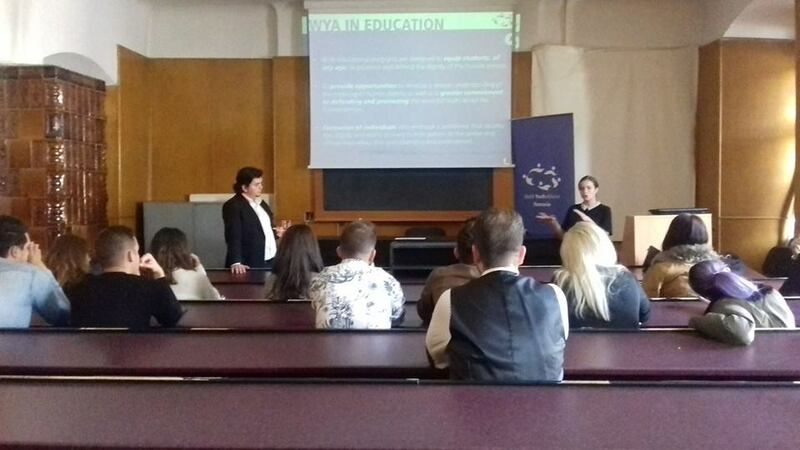 On November 10th, 2018, WYA Romania Advocacy Vice President Ovidiu Ștefan Gherasim and Education Vice President Delia Balan held an extensive presentation of the organisation with the purpose of orienting the city’s youth to a bigger and new challenge – the extension of WYA Romania to Cluj-Napoca. After a week of market research on NGO’s in Cluj, the team had met several young people with a great perspective from the city whilst also discussing with Babeș Bolyai University teachers. Eventually, they had managed to gather a potential team who are motivated to take the WYA Romania Chapter further in Romania after the initial launch of the organisation in Iasi this summer. “We are always looking forward to meeting people who share our values when it comes to human dignity and the people in Cluj that attended the presentation proved that our mission there is exactly what the youth is looking for in the society. This made us confident in our actions there on the long term and the people who will engage on promoting the WYA mission.” said Delia Balan. A training on the Certified Training Program will be held until the end of November. Afterwards, an opening conference of the WYA Romania in Cluj-Napoca will be held in December to finish the year strong. Altogether, the event was a success in taking the first important steps in promoting human dignity for years to come in western Romania. For more updates, check the WYA Romania Facebook page.